The ongoing controversy and litigation over the Trump administration’s “Muslim ban” has reignited a debate that has raged since the 9/11 attacks: Who commits more domestic terrorism–violent Salafists or traditional “right wing” extremists? According to a Government Accountability Office (GAO) report, it’s the latter and by a very wide margin. Are they right in claiming that, since the September 11 2001 attack, there have be significantly more terrorist incidents perpetrated by right wing extremists than by islamic terrorists? NB this is a question about the number of attacks not the likelihood that a member of a particular group will commit an attack. The question has been addressed by the non-partisan Government accountability Office. White supremacists, anti-government extremists, radical Islamist extremists, and other ideologically inspired domestic violent extremists have been active in the United States for decades. Examples of attacks include the 1993 World Trade Center bombing by radical Islamists, in which 6 persons were killed; and the 1995 Oklahoma City bombing of the Alfred P. Murrah federal building by anti-government far right individuals, in which 168 lives were lost. The September 11, 2001, attacks account for the largest number of fatalities in the United States in a single or closely- related attack resulting from violent extremism in recent decades. While the September 11, 2001, attacks were perpetrated by foreign violent extremists, from September 12, 2001 through December 31, 2016, attacks by domestic or “homegrown” violent extremists in the United States resulted in 225 fatalities, according to the ECDB. Of these, 106 were killed by far right violent extremists in 62 separate incidents, and 119 were victims of radical Islamist violent extremists in 23 separate incidents. If this count is credible, it appears that whether you count incidents the "home-grown" right wingers have caused more terrorism in the USA than Islamic extremist inspired terrorists (though the number of deaths is similar). Since September 12, 2001, the number of fatalities caused by domestic violent extremists has ranged from 1 to 49 in a given year. 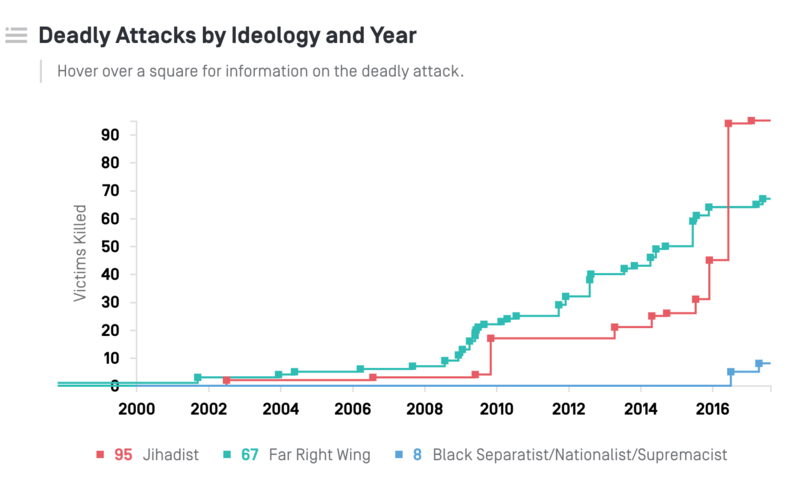 As shown in figure 2, fatalities resulting from attacks by far right wing violet extremists have exceeded those caused by radical Islamist violent extremists in 10 of the 15 years, and were the same in 3 of the years since September 12, 2001. Of the 85 violent extremist incidents that resulted in death since September 12, 2001, far right wing violent extremist groups were responsible for 62 (73 percent) while radical Islamist violent extremists were responsible for 23 (27 percent). The total number of fatalities is about the same for far right wing violent extremists and radical Islamist violent extremists over the approximately 15-year period (106 and 119, respectively). However, 41 percent of the deaths attributable to radical Islamist violent extremists occurred in a single event—an attack at an Orlando, Florida night club in 2016 (see fig. 2). The caveat at the end of the quote reflects the difficulty of using simple summary statistics for rare events as any average is highly skewed by single large events. Controlling for target type, fatalities, and being arrested, attacks by Muslim perpetrators received, on average, 449% more coverage than other attacks. The source document which appears to have emerged from Homeland Security seems to clarify some of the previous claims and provide additional estimates of the future threat as well as the historic patterns. This seems to clarify and reinforce the earlier claims in this answer. I'm going to list this as unclear. Among 7 recent incidents with fatalities I looked at in a bit of detail, 4 were islamist and probably 3 were non-islamist far-right. The details are sufficiently muddy that I supect that anyone can bend their criteria or definition or reporting period such as to make this claim either true or untrue. Details below. The claim is problematic, because there are no sharp definitions or characterisations of either islamic extremist or right-wing extremist. I would consider islamic extremists as a subset of right-wing extremists (surely they're not on the left?!). For the purpose of this question, I interpret the claim to mean right-wing extremists as non-islamic right-wing extremists. There are plenty of mass shootings in the USA that are not typically described as terrorism. Does it become terrorism if someone has praised IS or Hitler on the internet? Does it become terrorism if someone has an IS or Nazi flag at home? Does it become terrorism if IS claims an attack as theirs? Second disclaimer: in my analysis, I lump together very different views under a common label of far-right / right-wing. See also some questions elsewhere on SE such as here and here. Criterion I: The act must be aimed at attaining a political, economic, religious, or social goal. Criterion II: There must be evidence of an intention to coerce, intimidate, or convey some other message to a larger audience (or audiences) than the immediate victims. Criterion III: The action must be outside the context of legitimate warfare activities. Between April 2014 and November 2015, there was at least 1 attack by far-right and at least 0 by islamists, with most by unaffiliated individuals. With more than 50 casualties, only the September 11 attacks (islamists) and the Oklahoma City bombing (unaffiliated individuals) qualify. San Bernandino: Two assailants opened fire on a holiday party at the Inland Regional Center for disabled people in San Bernardino, California, United States. The assailants also attempted to trigger an explosive device, which failed to detonate. Fourteen people were killed and at least 17 people were injured in the attack. Both assailants, identified as Syed Rizwan Farook and Tashfeen Malik, fled the scene but were located and killed in a shootout with police later the same day. No group claimed responsibility for the incident., but also "UPDATE 3-Islamic State says California killers of 14 were their followers," Reuters, December 5, 2015.". Probably islamist. Colorado Springs: An assailant opened fire on a Planned Parenthood clinic in Colorado Springs, Colorado, United States. Three people were killed and nine people were wounded in the attack. An individual, identified as Robert Lewis Dear, claimed responsibility for the incident and stated that he was a "warrior for the babies.". AFAIK there is no evidence that Mr. Dear was inspired by islamism, so then he would qualify as a right-wing extremist. Merced: An assailant attacked students on the University of California campus in Merced city, California, United States. Four students were injured in the attack. The assailant was shot and killed by police officers. Faisal Mohammad claimed responsibility in a note left at the scene., and "Attacker who stabbed students at UC Merced had ISIS flag, FBI says," CNN, March 18, 2016.". Probably islamist extremist. Lafayette: An assailant opened fire on the audience before killing himself at a screening of the movie Trainwreck in Lafayette, Louisiana, United States. At least three people, including the assailant, were killed and nine other people were injured in the assault. An individual, identified as John Russell Houser, claimed responsibility for the incident and stated that he carried out the attack with the intention that it would harm the United States (US) economy.. No evidence for islamist sympathies. However, Wikipedia notes that Houser was said to have been a misogynist and praised the actions of Adolf Hitler on online message boards., so I will classify this one as far-right. Chattanooga: An assailant opened fire on the Navy Operational Support Center in Chattanooga, Tennessee, United States. Five military personnel and the assailant were killed and two people, including a police officer and a Marine recruiter, were injured in the attack. This was one of two attacks carried out by the same assailant within a short period of time; before targeting the support center, the assailant had opened fire on a recruiting office. No group claimed responsibility for the incident; however, the assailant was later identified as Mohammad Youssuf Abdulazeez.. The FBI claims those were the shootings were "motivated by foreign terrorist organization propaganda. ", which would classify it as islamist. Charleston: An assailant opened fire on parishioners at Emanuel African Methodist Episcopal Church in Charleston, South Carolina, United States. At least nine people were killed in the attack. An individual, identified as Dylann Roof, claimed responsibility for the incident.. No evidence for islamist sympathies, but there is evidence for white supremacy sympathies, so this is far-right. Garland: Two assailants opened fire on the Curtis Culwell Center, which was hosting an exhibition of cartoons of the Prophet Muhammad, in Garland, Texas, United States. The assailants were killed and a security guard wounded in the attack. The assailants were identified as Elton Simpson and Nadir Soofi and had claimed response for the attack in twitter statements before the shooting.. Has been claimed by IS, probably islamist. The New America Project says that there are 95 Jihadist deaths, 67 Far Right Wing deaths, and 8 Black Separatist/Nationalist/Supremacist, in the US since 9/11. Jihadists lagged behind Far Right Wing until 2016 with the 2016 Orlando Night Club Shooting. The site has information about each attack, obtainable by hovering the cursor over any given square. Not the answer you're looking for? Browse other questions tagged united-states terrorism . Is the biggest terror threat in the US white men? Are private doctor's consultation fees higher in India than the USA?